Emina Bicakcic reading a poem to Hillary Clinton in 1996 in Tuzla, Bosnia. SARAJEVO, Bosnia – Despite Hillary Clinton’s false claim that she came under sniper fire upon landing in post-war Tuzla, Bosnia, the Democratic presidential candidate still has the support of Emina Bicakcic, the Bosnian “tarmac girl” who greeted her with a poem that day. In March 1996, shortly following the conclusion of the Bosnian War, Clinton flew to the reeling Balkan state to meet United States troops and boost their morale. 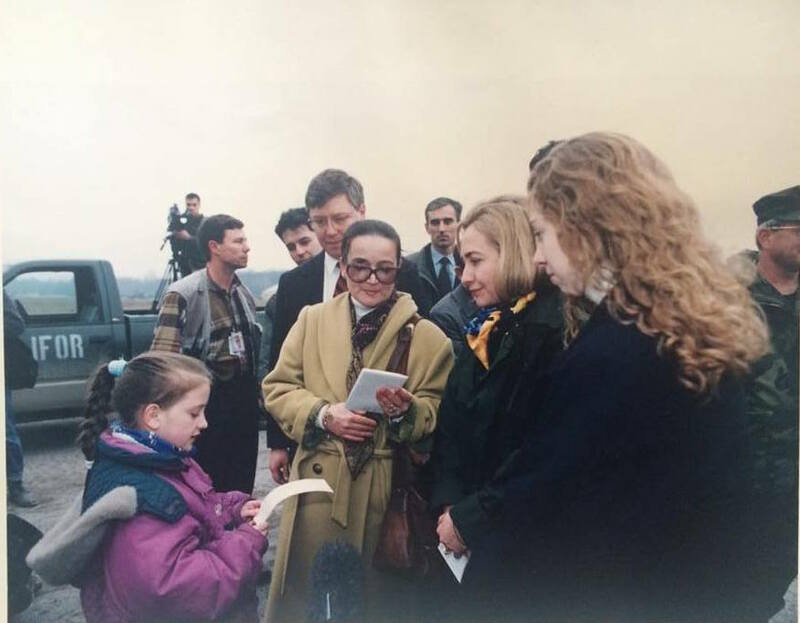 After landing at an air base in Tuzla, Clinton walked onto the tarmac; met Bicakcic, then 8 years old; greeted her with a kiss; and listened to a poem the Bosnian girl had written about the newfound peace in her country. Clinton said she really liked the poem, Bicakcic said. Twelve years later, during her initial presidential campaign, Clinton falsely claimed in a speech that she came under sniper fire after landing in Tuzla and that she had to duck and run and skip her scheduled greeting ceremony. After major media exposed Clinton’s account of the events as false, the then-senator said she misspoke. Bicakcic, now 28 and a medical doctor in Sarajevo, said Clinton’s remarks about the sniper fire surprised her. Bicakcic said she did not recall there being sniper fire on the day she met the-then first lady, but Bosnia was still unstable at the time. “It was very brave of her to even come, and we were honored that she came when nobody else wanted to come to Bosnia and to see how it was,” Bicakcic said. It was also very brave of Clinton to bring her daughter, Chelsea Clinton, Bicakcic added. Bicakcic said, in her eyes, then-president Bill Clinton stopped the war in Bosnia, so it was incredible for her to meet his wife. Until that point, Bicakcic had spent much of her life without running water and electricity and under constant threat of grenade and sniper fire. The Sarajevo native brushed off Clinton’s sniper fire claim as “just politics,” saying she is plenty used to hearing Balkan and Bosnian politicians exaggerate or falsify stories. “Doesn’t the world have much bigger issues to solve than was there or wasn’t there shooting in Tuzla?” Bicakcic said. Clinton critics, though, have seized on the sniper fire claim to further their argument that the Democratic candidate is a dishonest politician. In 2008, her false account of the Tuzla trip dealt a blow to Clinton’s initial presidential campaign, which was then engaged in a heated race for the Democratic nomination against then-Senator Barack Obama. This year, critics have at times tossed in the Tuzla story while discussing Clinton’s alleged lies about the 2012 Benghazi terror attack and the State Department email scandal. “Just look at her pathetic email server statements or her phoney landing in Bosnia where she said she was under attack and the attack turned out to be young girls handing her flowers,” Trump said. Bicakcic says she favors Clinton over Trump due in part to concerns that the Republican candidate does not have an aspiration for world peace. Bicakcic also says the leader of the United States sets an example for Bosnians to follow. Likewise, she is interested to see how a woman would function in that role. Heading into the final weekend before the election, polls indicate Clinton has a narrow lead over Trump. To The Can I say!! !throw her in the can..
Emina Bicakcic, now 20 and studying to become a doctor, told The Post she stood on the tarmac at the air base in Tuzla, greeted Clinton and even had time to share the lines of verse she’d written – all without fear of attack from an unseen enemy. Still, Bicakcic admitted that she is not supporting Clinton in her contest against Barack Obama. A worker at the airstrip where Clinton landed said the surrounding hills that could have harbored snipers were far too distant to pose any real threat to the first lady. He said that he found her false account hard to stomach and that it unnecessarily revived difficult memories. Many Bosnians – still confronted with bullet-scarred and burned-out buildings from Sarajevo to Tuzla – said their very real experiences with violence should not serve as cheap fodder for Clinton’s political ambitions. “It was a horrible lie,” said 29-year-old Midhat Efendira. Like most Bosnians, he expressed a deep appreciation of Bill Clinton for his role in ending the war. But he found Hillary Clinton‘s remarks intolerable. Efendira said that Bosnians are closely following the US presidential race and that Hillary’s remarks have damaged the formerly untouchable Clinton name in the country. Numanovic said his paper has not even bothered to cover the story. He, he, he……. can’t wait. Well this is a game changer for me, ok? I was going to vote for Clinton until I read this incredible expose’ of massive dishonesty, believe me. Any candidate who lies is automatically disqualified in my book, ok? The disgraceful, dishonest media shows how corrupt and rigged they are by putting all the stuff he says and does on TV, you understand? Pathetic! But we the people are going make America great again like it was when everyone other than white male christians were shut out of huge segments of US society, didn’t have equal access to jobs, housing, education, health care, or financial services. If you were a woman, you weren’t even allowed to vote. All good points brought up by the peanut gallery; I have nothing more to add on that regard. However, I do have to say: NICE SCOOP, CCN! That is pretty pro, even if many may not care or despise Hillary (I for one, do). Sober up man! You are making this site look unedumacated. Who cares? Bill and Hillary screwed up the Balkans by getting involved in the first place. One more thing Hillary lied about. Hopefully we don’t have to see her every day for the next four years. In my opinion it was nothing more than a photo op. Ol Bill was the king of photo ops. So what makes a photo op even better? Embellish the story. Bicakcic talks about world peace. Huge clue that she is an atheist. Most Hillary supporters are atheists and want a Supreme Court that outlaws religion. The remaining so-called-believers are feeble minded. Worse yet, Kaine and HIS supporters are secret Satanists bent on introducing the teachings of Lucifer into public schools. Yes,yes, I can see the rounds flying by their heads. What a terrifying thing to experience. let us all gather hands and sing hallelujah Hillary was spared from the bloodshed.